This project enables access to culture anywhere, anytime, for everyone. Photo by Dixie Clough. 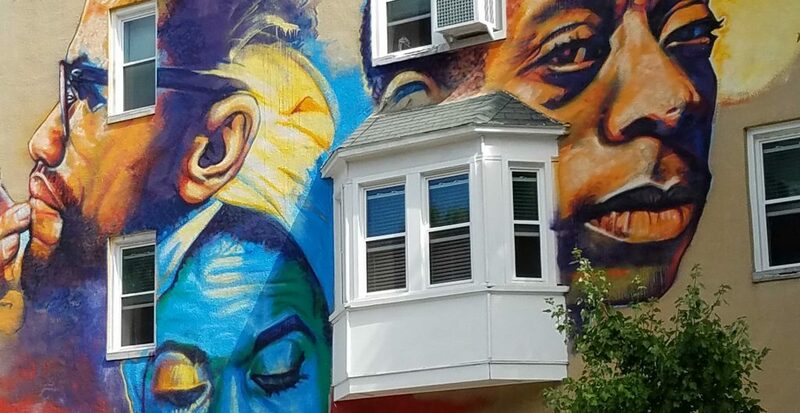 Murual by Ernest Shaw, Jr.
Be Here is an initiative to increase participation in cultural heritage by enabling more and more diverse voices to tell place-based stories of the communities and collections they know best. By publishing community-sourced stories on free and open platforms, Be Here capitalizes on the power and familiarity of smart phones to offer travelers and local explorers a new way to discover the often hidden culture, histories, and creativity around them. As people visit a place using their location-aware mobile devices, the stories of surrounding points and objects of interest can be triggered to play automatically based on their geolocations, immersing participants in the moment and creating a new genre of cultural experience and learning. Be Here: Baltimore is covering the city in a network of digital stories that offer an alternative to the images of Baltimore made popular by the entertainment industry and the 24-hour news cycle, replacing them with stories that reveal the real diversity, breadth and depth of Baltimore culture. 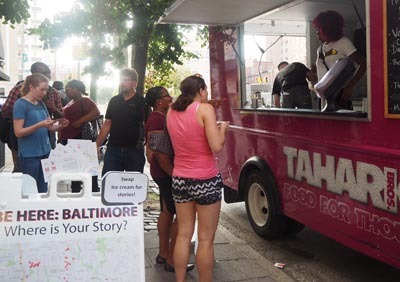 In summer 2016 we partnered with international mobile storytelling platform innovators izi.TRAVEL to launch Be Here: Baltimore with seed funding as well as training and expertise in new digital publishing technologies for storytellers and cultural institutions across the city. More than 400 cultural stories of Baltimore are now available online, and the soundtrack of the city continues to grow! Be Here: Main Street launched in fall of 2016. This pilot project is a partnership between MuseWeb and the Smithsonian Institution’s Museum on Main Street program, which brings Smithsonian traveling exhibitions to small towns across the United States and its territories. With additional help from US state humanities councils, MuseWeb is working with communities in Minnesota and Alabama to record stories about culture, history, people, and the things that make each community unique. Both Be Here initiatives enable individual creators as well as museums and cultural organizations to gain greater visibility and global audiences for their authentic accounts of places and collections. Be Here also supports capacity-building for storytellers, teaching 21st century skills in digital publishing and online content marketing that help creative people and organizations of all types find new ways of sustaining their cultural activities. Storytellers exchange their story for a free ice cream cone! Often cultural institutions spend more time and money on technology than on the content published by means of the shiny new tech. Be Here puts the spotlight back on the content by supporting platforms for location-based stories that are free, open, or shared, so that institutions can invest their resources in developing content about collections and programs, rather than in building yet another app or soon-to-be-obsolete platform. More, these institutions are constantly trying to find new ways to connect to audiences. Be Here helps them both engage with their current communities and develop new ones. Get specifics about what we do at MuseWeb and how we can assist cultural organizations. MuseWeb helps storytellers with training and capacity building on digital publishing and content marketings. By funding interns and fellows from underrepresented communities as well as local creators of culture, Be Here also helps cultural organizations reach new target audiences and learn how to tell stories better. Participation in a Be Hereprogram imparts 21st century skills that enable creatives to earn money and sustain their digital publishing initiatives wherever they may go. Geolocating cultural stories around the locations that matter to your communities creates new tools for outreach and content-based marketing. We place the stories that matter to your enterprise and audiences on the most popular free and open platforms. Told by authentic voices, this location-based content provides the “word of mouth” effect that eludes traditional advertising and business development initiatives, at a fraction of the cost. Overall, the proliferation of fascinating stories will pull more people into the city and specific districts. As your city’s culture thrives, so too will its business sector. Learn more about benefits to local businesses and how to connect cultural organizations and businesses.